We first reported on Tim Holtz's die-cutting machine from Sissix back in February 2010, shortly after he'd demonstrated the then unnamed prototype at the CHA (Craft and Hobby Association) show in Anaheim, California. We predicted that whilst it did seem to offer a few advantages over existing die-cutting machines, many of Tim's fans would want one for its looks alone. What really set this product apart, and would make it so appealing to altered art enthusiasts, we believed, was the neat and innovative packaging. It looked for all the world like a small suitcase. Fast forward now to July 2010, and the CHA Summer Show in Rosemont, Illinois, where Tim Holtz unveiled the production version of his new machine, now named the Vagabond. Our first impression is that it delivers all that we've been promised. In contrast to the somewhat crude colouration of the prototype, the appearance of the production version is much more subtle. The almost uninterrupted tan colour has been replaced by a much more subdued shade, it's textured to resemble distressed leather, and the rather brassy corner reinforcements of the original now appear tarnished. The same tarnished metallic finish is now used for the remainder of the fittings, except the handle, which now appears black, or perhaps an extremely dark grey. The distressed antique look is completed by vintage travel labels. Of course, the other thing that's new and different about the Vagabond is that it's motorised, and designed to cut or emboss anything that you can think of, from grungeboard and chipboard to wood, thin acrylic and fabric. The powerful motor is very quiet in operation, and can be run in either direction to allow you to operate the machine either left- or right-handed. As with the prototype, the power lead is stored in a side compartment, and there are now three buttons to be found on the top of the unit. The first opens the side panels that drop down to form the platform, and the other two control the operation of the motor. The machine weighs around 14lb (6.4kg), or almost twice as much as, for example, the Cuttlebug. The increased weight, however, means that it's much more stable, and won't wobble or tilt when in use. However, it's not all good news. Please see our warning at I've broken my Vagabond - how do I get it fixed? How much is the Vagabond, Tim Holtz's die-cutting machine? We believe that the initial recommended retail price in the USA was $249.99, but we had seen it advertised for as little as $199.99. A quick check in September 2013, some three years after the launch, revealed a wide variety of prices, with a maximum of $299.99. 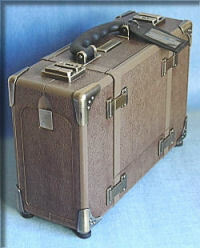 The Vagabond was released in the United Kingdom in late February 2011 with an electrical adaptor for European use. When we spoke to a local retailer shortly before the launch, we were told that the maximum UK price had been fixed at £199.99, but a number of suppliers were able to offer this product initially at around £150-£155 plus carriage. In September 2013 Hobbycraft, a major UK crafts retailer, was advertising this product for only £99.99 including delivery.